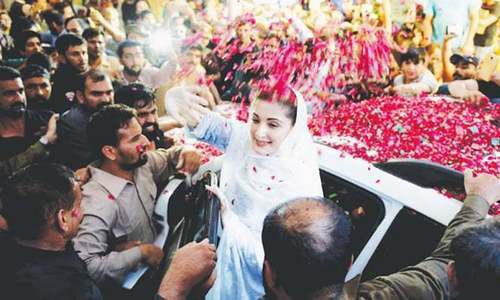 The Supreme Court has admitted for hearing a petition against a Lahore High Court (LHC) decision to dismiss applications challenging the candidature of PML-N candidate Kulsoom Nawaz for the NA-120 by-election. The top court will hear the petition on September 18, a day after the NA-120 by-poll is scheduled to be held. The PPP nominee for the NA-120 by-poll, Faisal Mir, had challenged the LHC verdict in the apex court on Friday. According to a cause list issued by the court, a three-member bench headed by Justice Gulzar Ahmed will hear his application. Mir has stated in his plea that Kulsoom failed to submit full details of her tax returns and statements of assets and liabilities. She purposely concealed her assets and did not disclose a United Arab Emirates iqama (work permit) attached with her nomination papers, therefore she is ineligible to participate in the by-election under Articles 62 and 62 of the Constitution, the application said. The PPP leader has urged the SC to quash the high court's September 13 verdict, which dismissed the appeals challenging the acceptance of Kulsoom's nomination papers. An LHC full bench with a 2-1 majority decision had on Wednesday dismissed three identical petitions challenging Kulsoom's candidature. PPP's Faisal Mir, Advocate Ishtiaq Ahmad Chaudhry of the Pakistan Awami Tehreek (PAT) and Nabeel Shahzad of the Milli Muslim League (MML) had filed the petitions invoking the writ jurisdiction of the high court. They had challenged the decisions of the returning officer and an election tribunal whereby nomination papers of Kulsoom Nawaz were accepted. The NA-120 by-election is scheduled to take place on September 17. The parliamentary seat had fallen vacant after Nawaz was disqualified under Article 62 of the Constitution in the Panamagate case by the Supreme Court. A cancer suffering noble women has been dragged into the race. I sincerely wish her complete recovery & I pray for sense for those who are not letting her rest in hospital tension free. The by-election will be held on Sept 17 and hearing of petition against Kulsoom Nawaz's candidature on September 18 just a day after election means the tax payers money spent on election process will be turn into ashes and who will responsible for all these useless expenditures? @Abdulla Hussain, her daughter the stupid so called wise advisor who is not caring about her mother,what people has to do ,We can pray for her for speedy recovery and wih a good health.This lady still think that people are stupid and I think so, they might give her a vote even I heared that they are having dirty water to drink. ECP must be told that not to declare winner unless SX gives its verdict. I am sure she is disqualified as she is part and parcel of this corrupt family practices. Rest I pray for her health and hope she lives for 100 more years but I don't see her in NA. What a silly decision to review a petition after the event! If petition is accepted then does this mean that bibi Kalsoom will be disqualified too to hold a position in politics? I also pray for her health. I believe she is a decent lady but unfortunately she is married to a thug and this is the reason why she is being dragged. In any case she is only contesting for Nawaz sake and her daughter is doing everything for her - of course with the support and weight of government machinery. @Abdulla Hussain That tells how 'caring' these people and their mindsets are to their own. What about anybody unrelated to them? what qualification does this woman have to be in the National assembly other than the surname Sharif? And then the noon leaguers argue that they are not a mafia! Don Corleone would have been proud. Husband has income of 1 million but keeps buying properties with tens of billions. Wife doesn't know and doesn't ask questions? OK, sure. Yeah, only in Pakistan. The wife of a former-PM disgraced and disqualified, under going (supposedly) Cancer treatment and unable to walk, speak or perform any duties required of a PM of a nation, conveniently out of the country now with pending cases against the family members...?? The whole shareef family should be disqualified from holding any election in the country. Their looted money should be bought back in the country. @Abdulla Hussain what about all the cancer ridden poor whose money has been stolen and who die without proper medical care....you are responsible for that along with all our politicians. One has to be amazed at the timing of our Supreme Court. Why is there no Que number on the cases so that everyone gets their cases heard in a que? That way it would be justice rather than politics. If this lady is suffering from cancer, how come she is deemed suitable and fit to occupy an office which is meant to write laws concerning citizens of Pakistan. If a pilot cannot fly a plane due to medical reasons how come it's allowed for someone to occupy a seat in parliament on if medically not fit? In addition to other failings, the lady failed to disclose her ownership of a house in Landon and source of money to acquire this property which her son Husain Nawaz has admitted in TV interview stating that his mother also own a property, which is not a flat but, a house there in London. I'm sure that the people must know it's source because they suspect this being part of our stolen money. @Aamir Latif What? Since when catching thieves has becoming useless? Valid request. Let not replace on corrupt and disqualified PM NS with another one. Let Pakistan move to progress and close NS and his corrupt family chapter forever. Recover looted money and put these money launderers in jail. Trying to win elections through the judges rather than the voters ? @Abdulla Hussain Cancer is simply a Drama to gain sympathy and nothing else. She is having good time in London with her family at Tax payer Money ,Please note Mr.Abdullah. This is too much. Why are the chasing her? @Abdulla Hussain she like anyone deserves all the compassion and prayers in her sickness but if in that sickness you jump into politics, you can not ask for being exempted from the law like 'leave the kitchen if you can not bear the heat.' You can not eat the cake and keep it at the same time. @ZAHEER so, the person is disqualified, even if she wins. The loser will be declared elected. Is this the law? That's why its called "Supreme" court!!! @Abdulla Hussain We hope that Cancer suffering 'NOBLE' women still has a functioning head on her noble shoulders to think of her self. What is good and what is bad for her. Or does she need advice from noble people with noble functioning heads to tell her what is not good for her health. Why must the PPP agree whether or not she can run for office? Are they trying to steal Imran Khan's thunder? KN is no where in panama gate. Never held a public office.Why can't she contest NA 120 even if her husband and family are being tried by NAB. Even NS and family is not yet convicted by NAB or SC so why can't she contest an election? Any man entering a govt. service needs to produce a medical fitness certificate. Here a person with cancer (all good wishes for her health) is contesting for a NA seat and possibly PM. The Election Commission of Pakistan is controversial from day one. It has been openly siding with PML(N). @F Khan IF she's never held public office,or any job or profession, it means she has no clue how to run even a school or a shop, much less administer a government, surrounded by three hostile powers. Does the word 'Qualification' mean anything to you? Or do you suppose, any butcher, tailor or Pannwala,. richshawala should also be allowed to contest an election and get elected to the highest office in the land? @faiq - don't be so pessimistic and impartial, have a faith honorable judges and supreme Court. They make decisions on evidence presented and according to law without any discrimination or status of the accused. @Abdulla Hussain: No one from NS immediate family can contest this election. So the NS had to nominate his wife Kulsoom. This election is not about PMLN or PTI.It is about public opinion on judicial judgement.So an immediate family member was nominated although the lady has cancer and can not run her campaign. It is important with what margin she wins? This will tell the public mood for or against the judgement. It is not a useless petition. It is because of the corruption of this elite of Pakistan that we are in this state. Putting his own wife over all others to run the office of PM who cannot run even a Mayors office is a joke for this country and office of PM. I pray for recuperating of Kulsoom Nawaz from fatal disease. I want to be triumphant in her upcoming political combat. 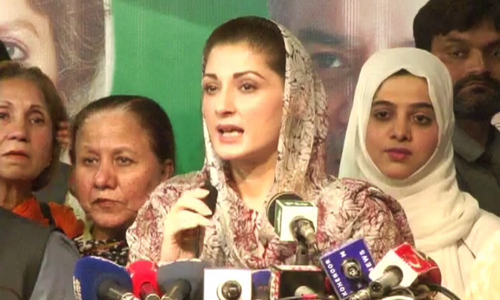 I applauded the diligence of Maryam Nawaz during electron campaign. If someone wins elections and later found out to be a liar and hiding facts and taxes, should he/she be allowed to go ahead? I pray for recuperating of Kulsoom Nawaz from fatal disease. I want to be triumphant in her upcoming political combat. I applauded the diligence of Maryam Nawaz during campaign. @Khalid M Rehman please let the nation know that under what qualifications you were calling Maryam Nawaz stupid. She is smart enough to go to medical school and become a doctor and strong enough to speak in front of a crowd. She has the courage to deal with a defiant opposition. Lets have some sense and respect and follow the tradition and culture who has high place for woman, no matter who. @Syed Zafar Kazmi U.S.A How come she deserves our compassion, do we, you, sympathise with thieves and thugs in the country? If anything she and her family deserves our total rejection if not wrath and vengeance and hatred. @Abdulla Hussain Noble? Wow, some nobility! It is a valid case for disqualification. Besides she needs more medical and health care and will not be able to do any official work responsibilities as a member of Parliament. Sharif family should know this well and provide her relief at this time rather than a burden of responsibility. I totally second Aamir Latif's comments, Judiciary needs to process normal peoples' cases because countless criminals need to be convicted and punished, and there would be countless innocents held who need to be released. Hope some sense prevail and she should sit home and get well and recover first rather than struggling . She knows it will not be possible for her to Lookafter people and welfare of her constituency. Kulsoom Nawaz is also corrupt like her husband and the rest of the Sharif family. 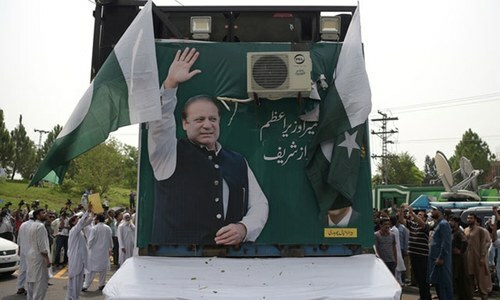 Mrs. Nawaz Sharif, a cancer-stricken woman has been used to get the sympathy vote. Sharifs will go to any extent to stay in the power. How can an ailing person perform the rigorous activities as a member of National Assembly! @Ravi yes this is the law. @F Khan you dont know ok.
@F Khan all valid points but you are forgetting the fact that a bunch of thugs are determined to get Sharifs and would pounce on any and every opps they can find to hurt Sharif! The vendetta is crystal clear and there are absolutely no limits they would not stoop to, to satisfy their egos and to please their masters! Dont disturb this family because they are free to do corruption. Honestly speaking, the SC judges are now coming across as fools to be taking up such petitions when these should be dealt by EC. The SC registrar should have rejected it in the first place.Have some shame. @F Khan KN is qama holder, assets concealment for her properties worldwide, tax returns etc.You have limited info. @Abdulla Hussain we know about her fake cancer.This was all drama and lies. It will be a great riddance. @Khaleesi indeed! Nothing is more fun than staying on the prowl to pounce on every opp that would allow the perpetuation of the fun -- settling the score with Sharifs. It is now so personal that a 5 year old can see that their priorities are all MESSED UP! How can a lady with throat cancer be roaming around freely in the UK and dining at NANDO's with her husband. Seems the cancer issue is fake just to gain sympathy vote. She should be disqualified. I heard the PML-N croonies are paying 25000-30000 to each residents of NA-120 to get them out and vote for Kulsoom. This money could well be used for the improvemnt of hospitals, road, schools in NA-120 than to bribe the people. SC please wake up and disqualify Kulsom Nawaz please. @Abdulla Hussain She is being dragged in to this by her own disgraced and cunning family. Please DO NOT blame others for what her own family doing to her for their own political game. What a shame. PPP, PTI and other parties cannot defeat Mrs Qulsoom Nawaz in NA 120 elections. The writing is clearly on the wall that she has a comfortable majority. This SC drama is the only way they can possibly disqualify her and 'win' a sham election, with the blessings of some people behind the scenes. Where are we headed? What will become of this nation? This should have been sorted a few weeks back - it's too late and if she wins and SC dismisses her it will look as if the SC has gone against democracy..
You are absolutely right Abdulla. Nawaz Sharif and PMLN are to be blamed for dragging Kulsum Bibi in this race. Couldn't they find another candidate for NA120 or they want sympathy votes. By the way Mr Nawaz Sharif has been seen shopping in Channel Shop on Bond Street with Khawaja Asif, it is not the first time that he has been seen shopping in expensive stores during this visit of his. As they say, greed has no boundaries. Pakistan supreme court is now turned into anti nawaz court and judges only job is to keep helping the other prtirs who will never win with votes. pti and ppp only chance to win election is if sc helped them by banning all their opponents. Why we spending money on elections anyway? SC should nominate a winner and that winner will be someone related to pti. @Abdulla Hussain . This election is about Pakistan taking one more step in the direction of establishing democracy. Therefore all procedural laws must be followed conscientiously for the election to qualify as fair and legitimate. The question of individual sickness is irrelevant to the central question of a legitimate electoral process. Arizona senator John Mccain was also recently diagnosed with a serious and aggressive cancer. However his sickness has not brought any special consideration to him in his political work. So the underlying thought in Abduallah Hussain's comment that Mrs. Nawaz merits any special consideration in the democratic process just because of her illness is not justified, although as compassionate human being, we all pray for her recovery and return to good health. @Gerry dcunha I agree with you but place a clause after your sentence 'if they prove that the money was taken through corruption'. And just by the way if they couldn't then will you stand by the idea of giving them their nationalised industries and it's worth back? @Aamir Latif These cases are of vital national interests and need immediate attention. So my friend the SC has the right priorities set for themselves. Why is the SC continuing to waste their time and the publics's money over such frivolous matters? Don't they have anything better to do? It seems they want to insert themselves into anything and everything that gets them in the news. If you so sympathetic, why don't you ask her not to bother with politics and just stay put. Pakistan needs term limits on elected politicians. And those should apply to up-down blood and marriage relatives. No spouses. No grandchildren/children/ parents/ grandparents. No in-laws. @F Khan She is owner of a house, according to her son alhamdulilla, acquired through the money her husband stole from the public money and she has not declared its ownership as required by election laws. Enough reason to disqualify her from even contesting an election. And by the way, have you forgotten already that her husband has been convicted and disqualified by the Supreme Court for being dishonest and a liar and not trust worthy. Come on, Khan jee, you are trying to defend indefensible, we are talking about thugs, a whole family of thugs, congenital crooks. As a 'noble woman' she should not have agreed to contest the election because she knows she is not in good health to do her job as MNA. People elect MNA to work for them, not to just promote the family interests. If Judiciary continues to give such controversial verdicts then it will very soon loose it's credibility, rule of law must prevail for all, whether it's a dictator, a Chief Justice, a Parliamentarian, a beaurocrat or just an ordinary citizen of Pakistan. Besides six hundred names mentioned in the Panama case, a judge's name is also given but so far no action has been taken with respect to anyone as yet, now that looks fishy. @Abdulla Hussain many people have cancer and hope they recover. Can you tell me experience and education of kulsoom to run for seat as a U.K national? If SC decides otherwise then RO and tribunal should be taken to task. ECP has made it point to pass on the buck higher courts to wash their dirty linen. Does it make sense to hear the petition after relevant election is over. Its like administering medicine after patient is dead. If Kulsoom Nawaz is so ill why she is interesting is the political petition? why is she bothering & wasting the taxpayers' money? all the is family corrupt. You are withdrawing millions from National Treasury and you are expense on the Public Finance. Kindly, do your work rightly, efficiently and effectively. So, you can return Nation with good and sound justice. Stop pending the cases for years and decades. If you can't do your work we have an option to privatize the judiciary so we can bring efficiency and effectiveness. Masses are not satisfied by your function and work. @Abdulla Hussain she is Noble in your term. Ur not noble enough to mark a gigantic corruption by her husband, sons, daughter, son in law, so on do forth??? Strange. Isn't??? It's sad. The family is forcing a sick old woman to play politics. @Aamir Latif Respected Sir! is it not of utmost priority that the honorable judges ensure that the candidate running for elections should be Truthful and Loyal to his people, He/She has no accounts on foreign land or He/She is not corrupt. Definitely it is not the work of Supreme Court but NAB, FBR, FBI and even Interior ministry fail drastically on such accounts then someone has to take notice for the betterment of the state. This someone is Supreme court and so far they have done the job in an adequate manner.